Billy Graham offers hope and biblical wisdom for today's challenging problems. The daily news is jammed with alarming headlines of conflict in the Middle East, economic crisis, and terrorist threats around the world. 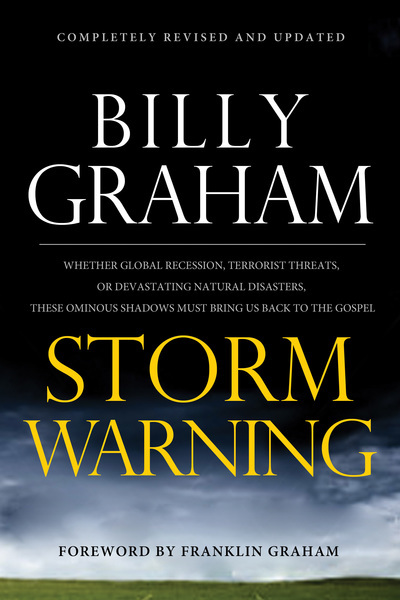 In Storm Warning, Billy Graham — the best-known evangelist of our time — examines today’s most challenging problems and adds his voice and perspective to what the Bible says about the storms we are facing... and the storms yet to come. Since its original publication, Graham has added nearly two decades to his ministry and has lived through several more storms. This completely revised and updated book highlights Graham's experiences, insights, and renewed sense of urgency as he examines the book of Revelation in light of current events—and sees prophetic events become reality.